There have been a few noteworthy updates to this site recently. 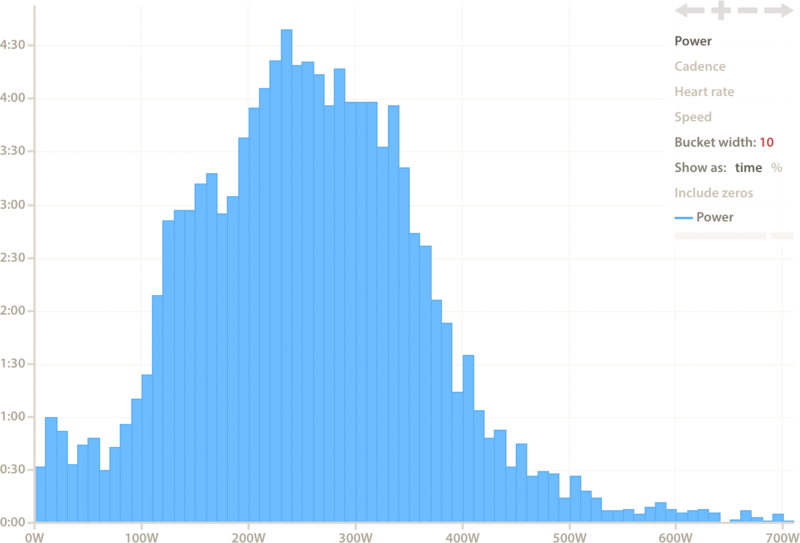 The histograms chart has been rewritten to be better and more flexible. Most notably, the bucket width can now be modified. A number of changes have been made to training plans. Intensity, distance and climbing can now be specified for workouts, and when any two of duration, training load and intensity are specified, the other is calculated automatically. If all three are entered, the one entered least recently is changed. Effective power is also displayed, and is calculated based on intensity and the athlete’s current FTP. Effective power for workouts is kept up to date when changes are made to the athlete’s FTP, and will be recalculated for each athlete for workouts that are saved to the training plan library and given to multiple athletes. Automatically calculated values are indicated with the lightning bolt icon, as in the image above, where duration and intensity have been entered. Finally, on the topic of training plans, clicking on a day in the calendar in the future now brings up the “add training plan” interface directly. Charts and images have been updated to work properly with high pixel density displays (aka Retina displays). The main ride chart shows time spent in power or heart rate zones for selections when the zones overlay is displayed. Receipts can be viewed from the billing page. Flexicharts have gained some new options for creating tables. The “monthly summary table” in the built-in library demonstrates what can be done. There’s now a relatively easy way to import rides from Zwift.